freestompboxes.org • View topic - Detectors in compressors and Envelop filters. I studied the principle of operation of the detectors and began to analyze the circuit, however I asked a number of questions. 1) Why do they use only half-wave rectifier in Envelop filters? Why no one uses a full wave rectifier? 2) Compressors use different types of rectifiers and half-wave and full-wave rectifiers. Why do primitive and classical circuits like Dyna Comp or Diamond use a full-wave rectifier, and modern circuits like THAT use only a half-wave rectifier? Is this somehow related to Peak / RMS compressor types? 3) Classical detector layout in OTA / OPTO compressors, how relevant is it today? Or is it worth looking at a precission full wave rectifier? Re: Detectors in compressors and Envelop filters. Great topic. I did not realize the THAT detector was half wave. Where did you find this info? I would assume the only reason to use a half wave would be to limit complexity/make it cheaper. In the case of envelope filters, fast attacks are probably not needed, so a half wave could be fine. Ome of these half wave envelope filters do have signal distortion imparted from the control signal however. A good or bad thing depending on what you like. bmxguitarsbmx wrote: Great topic. I did not realize the THAT detector was half wave. Where did you find this info? 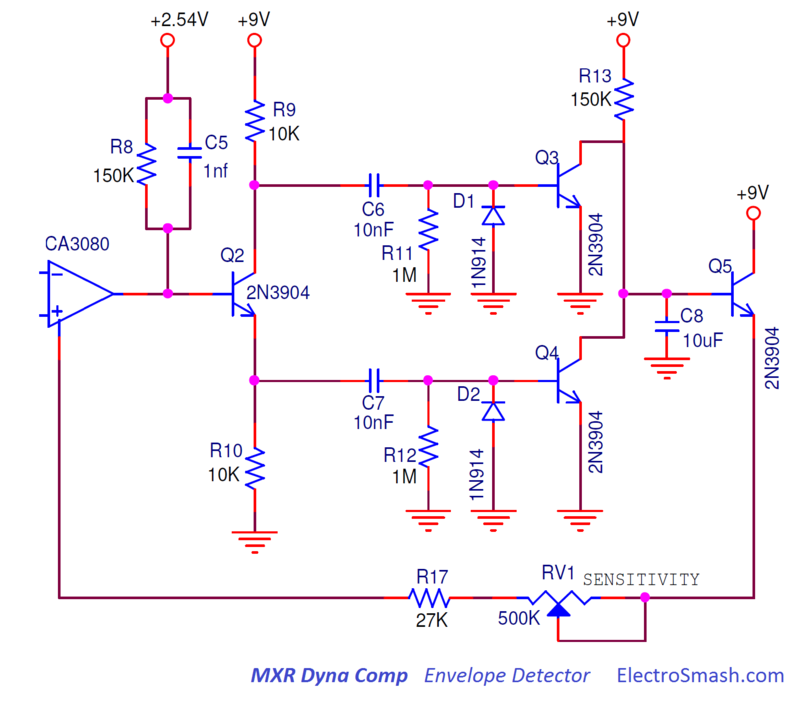 Threshold detector in the circuit for that4301 classic half-wave rectifier. A few minutes ago I was re-reading the documentation and if I understood correctly, this was done because this is an RMS compressor. 1) The signal falls on the RMS, it aligns the voltage relative to the average value of the minimum and maximum (as should the RMS compressor). 2) Our average voltage falls on a threshold detector (half-wave rectifier), which we set to a certain level, as soon as the average voltage exceeds the set threshold, the compressor starts to operate. I can not find, it was exactly yesterday on the THAT website, perhaps not in the notes, perhaps in datasheets. Cool. I will look for it. couple notes about the Ross Dynacomp method of full wave rectification. Once threshold is crossed, the transistors turn on with an exponential response. I suppose this would be similar to having the ratio on a knee. The harder you hit it the higher the ratio. Looking at it on a scope these two FWR transistors clip pretty early on. It seems that you could change the response quite a bit by selecting for gain of these two trannies. bmxguitarsbmx wrote: Cool. I will look for it. The release and attack time can be adjusted by changing the resistance between the emitter and the ground and between the collector and the power supply. Scheme can be found at EQD Warden. However, the situation is ambiguous, for many manufacturers, the change in resistance between the collector and the power supply is responsible for adjusting the attack, but often on the Internet you can find information that the adjustment actually changes the release time, and manufacturers indicate an attack from marketing campaigns (this is easier for inexperienced users). In general, I am interested in the option of a good detector with the ability to adjust the attack and release, and working from a unipolar power supply. I have seen quite a bit of wrong info on the ross detector. Attack would be how fast the transistors can drain the capacitor, so capacitor size would do it. Release is then how fast the collector resistor can charge that cap. But increasing that resistor will also increase gain. It's a neat design, but everything is highly interactive. I spent a lot of time building an envelope filter using the Ross detector and that was a mistake. It is actually quite temperature sensitive. I keep the cover off the bottom so that I can trim it regularly. Total PITA. Somehow we don't notice it with the Ross Compressor. Maybe it is because we are slamming it so hard. it doesn't work reliably in the between saturated and off region. bmxguitarsbmx wrote: I have seen quite a bit of wrong info on the ross detector. Attack would be how fast the transistors can drain the capacitor, so capacitor size would do it. Release is then how fast the collector resistor can charge that cap. But increasing that resistor will also increase gain. It's a neat design, but everything is highly interactive. I spent a lot of time building an envelope filter using the Ross detector and that was a mistake. It is actually quite temperature sensitive. I keep the cover off the bottom so that I can trim it regularly. Total PITA. Somehow we don't notice it with the Ross Compressor. Maybe it is because we are slamming it so hard. it doesn't work reliably in the between saturated and off region. I am also interested in the version of THAT compressor with the ability to customize the attack and release time. However, I am also interested in the project 1176 in the pedal format, but I did not see any circuits without an input transformer and an output transformer, as well as with the replacement of a 5 Mega oM potentiometer. Unfortunately the schemes Cali76, MXR Studio / Bass compressor, Empress compressor is not on the Internet. OK, we discussed the compressors and it gave me a lot of useful information and understanding. Let's go back to envelop filters. Why in all popular circuits - Q-Tron / Mu-Tron 3 & 5 / DOD fx25 & 440 / Mad Professor SWAW and many others we see the detector for only one half period, regardless of whether the circuit works from 9V or from bipolar power supply? Is this somehow related to the mode of operation of the filter up and down? Will the filter capture both half-periods and give strange sounds or is there simply no need for a full-wave detector? POTL wrote: OK, we discussed the compressors and it gave me a lot of useful information and understanding. From my experiments, which have been quite extensive, the half wave is only used to be cheap. Superior results are had by full wave rectification. Unless you want that "gargle" distorted VC sound. You cold analyse the "attack times" of envelope filters to see if they tend to use longer times and therefore not needing the better performance that FWR provides. it is working really nice! It is working wich unipolar power supply, has attack and decay controls. And reverse sweep. It needs some gain stage/booster in front of it, since just the direct guitar signal seems to be too weak. A problem was the attack, because increasing attack really lowered the amplitude of the envelope output. So i tried to compensate that with a dual pot (second pot in the feedback loop of U1B) witch increases gain while increasing attack time. The envelope output peaks are around 2-3V (also depending on the input), maybe i add a option to scale this voltage. Just wanted to share this, maybe it goes int the direction of what you are looking for, hope you can use it.